Real estate agents regularly hear that they need to have a brand. Real estate agents need to brand themselves. That the brand is the best way to get leads. And many other variations that basically have the same meaning. Having a brands sounds like a great idea, until the Realtor stops to think what their brand actually is. Or even what a brand is in general. Or how to even to start. Is a brand a creative name, like “Seashore Villas Realty”? Is a brand a pretty logo, like the outline of a cottage on a beach with the name spelled out in the waves? Is a brand a catchy slogan, like “We sell Sea Chalets by the Seashore”? Is a brand a professional picture of the Realtor, like wearing a business suit on the rocks at the beach? Well, all of those could be part of a brand. But they are not the brand. The creative name, the pretty logo, the catchy slogan, and the professional picture all make up the Realtor’s brand. But there is more to the brand. The real estate agent’s brand is the promise they make to their clients. It’s not a literal promise, like “I promise to sell your house faster than any other Realtor.” But a Realtor’s promise of expectations to their clients. Let’s say for example that you had tickets to a Guns N Roses concert in the mid-1980s and had no idea who they were. What would you think about them if all you saw was a concert poster? First, the name Guns N Roses is an oxymoron of danger and love. Then the logo with the thorns of the roses wrapped around two guns with a black background would elicit some idea of their brand. Your ideas would be confirmed by their slogan under their logo that reads “G n’ F’n’ R”, which is easily understood as an abbreviation for profanity. And once you saw the picture of the band, each member with long hair, tattoos, ripped jeans, and bags under their eyes, you knew that they wouldn’t be playing classical music in Italian. On the other hand, if you had tickets to Andrea Bocelli, and saw and advertisement that he was wearing a suit with a white silk scarf, backed by an orchestra, standing still at a microphone, you would know that he’s not going to be singing heavy metal songs. In both cases, you can visually see each musician’s brand just by a concert poster. It is obvious the type of performance you will get even before you hear the first note. You would be very surprised if Guns N Roses actually played classical Italian music, just as much as you would be surprised if Andrea Bocelli belted out heavy metal. Ask anyone who has seen Guns N Roses’, and they will tell you that the band delivers on their brand promise. Likewise, Andrea Bocelli delivers on his brand promise. The brand of most real estate agents is not typically as extreme, but there are promises that Realtors should make to their clients with their brand. And Realtors need to deliver on their expectations. The name “Seashore Villas Realty” isn’t the brand, but it is part of the brand. From the name of this real estate agent’s business, a lead can assume that they specialize in properties near the ocean. The logo that shows the outline of a cottage on a beach with the name spelled out in the waves isn’t the brand, but it reinforces that the brand is ocean real estate related. The slogan “We sell Sea Chalets by the Seashore” is not the brand, but it’s a catchy jingle of a play on words that explains what the Realtor does. The Realtor is saying in their slogan that they work with oceanfront property. And the reference to the tongue twister suggests that the Realtor doesn’t take themselves too seriously. And finally, the photo of the Realtor wearing a business suit on the beach almost completes the brand. The suit makes them look professional. And the location on the beach really confirms that they specialize in properties near the ocean. You wouldn’t be surprised if they picked up their client in an new convertible Mini Cooper with top down, but you would be very surprised if they showed up in 1970s era Camaro. There are still things that we don’t know about this Realtor’s brand. What are they like to work with? What is their personality? Just how professional are they? Are they qualified? How much experience do they have? And as many more questions that you might have to decide if they are the right Realtor for the lead’s needs. What are the lead’s expectations? Can they find a Realtor that promises to deliver those expectations? Those are promises that far too many Realtor’s make. So what is wrong with them? They are promises that are almost impossible to live up to. They are promises that don’t really mean to much. They are the sign of a Realtor who will take anyone’s business. They are promises that are a sign of desperation. They are promises that leads can see right through. Leads don’t want a Realtor who will take just anyone’s business. A lead wants a Realtor who wants their business specifically… a Realtor who specializes in their needs… a Realtor who doesn’t try to be everything to everybody. People aren’t dumb. Let’s take a second and dissect each of those “promises” we listed. Why are they so bad? “I’m available day or night, 24/7”. What happens if the client has a burning question after watching their favorite HGTV show, and calls this real estate agent late at night after the agent has gone to sleep? The one time they don’t pick up the phone, they failed on that promise. The moral of this story is to not over-promise and not be able to deliver. “I will go above and beyond for my clients.” Well, this is a hard one to quantify. Real estate clients already have far too many expectations of their Realtors. Why give clients the authority to call the Realtor out on this promise. The only result is eventual disappointment to the client. “I work well with everyone.” Maybe this Realtor does have a great attitude. But look around the office. There are Realtors that you really don’t like to talk to, let alone know that you don’t want to do a deal with. The same is true for inspectors you don’t like, lawyers who may have been difficult, and the countless clients that you have worked with that you’re happy you don’t have to see again until they sell. This is a hollow promise, and it doesn’t help anyone out. “I’ll work hard for you”. Yawn…. “I specialize in luxury estates, first time home buyers, relocations, foreclosures, investment properties, and all of your real estate needs.” Seriously? Would you buy a steak if it was on the menu at McDonalds? Would you get heart surgery from a dermatologist? Would you go to a Guns N Roses concert if you hated heavy metal? Obviously the answer to all those questions is no, because those brands don’t try to be everyone to everybody. Those brands chose a niche, focus on that niche, serve that niche, and don’t stray to far away from that niche. Realtors should follow their example. Those promises also don’t show that the real estate agent can fulfil the lead’s specific needs. Those promises set the client’s expectations far too high. Even worse, those promises can’t even be kept. No Realtor wants to disappoint their clients, especially if it can be easily avoided. The easiest way to keep a promise is to do what you say you will do. The easiest way to say what you do is to determine what you actually do. As complicated as that statement might sound, developing a brand is much easier. 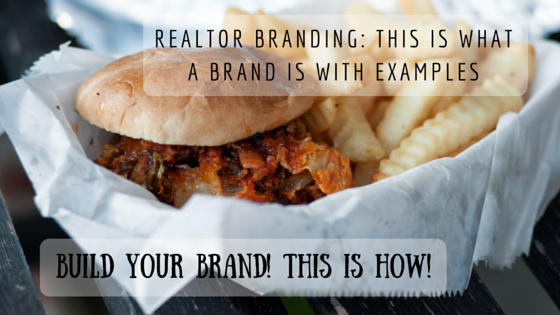 Because believe it or not, every Realtor already has a brand. The Realtor just needs to find out what their brand is, if they don’t already know. One part of the brand is the niche, which is the promise of the type of real estate the Realtor works in. The Seashore Villas Realty’s niche is very clear. They sell ocean front homes. They probably could sell an inner city condo, and they would if given the opportunity. But that’s not their specialty. People who need help with ocean front property will almost definitely use Seashore Villas Realty, because they brand themselves as the experts. It’s better to get the majority of ocean front property deals than to get very little of every kind of deal. The other part of the brand is the Realtor’s promise to their clients. A Realtor can probably figure out what they can promise to their clients. But it is more effective if previous clients tell the Realtor. What is the Realtor like to work with? How professional are they? How responsive are they? What is their personality? What is their aggressiveness during negotiations? How detail oriented are they? How do they prefer to communicate? How easy are they to reach? How closely do they work with their clients? What are they really good at doing? What types of things do they not do so well? The logo, the slogan, the pictures, the content (text) on the website, and everything else will be easy to create once the brand is defined. All of the things that are part of the brand will feel like they easily fall into place. Would your clients want you as their Realtor because you are the best fit for their needs? Or do you think they would prefer a Realtor who promises they can do anything, but most of those things are done no better than average? Would you suggest you clients order a steak from a McDonalds? If you are a Realtor who believes that a brand is important and want to create your own, Agent Sidekick can help. Sign up for a free consultation, and we will be in touch.